The other day we had some friends over, so I bought four pieces instead of one. Everyone loved the cheeses. Question: What's your favorite type of cheese? When was the last time you ate cheese? Fresh buffalo mozzarella. I love the milky and gooey taste of the fresh cheese. Awesome w/ other dishes as well. I had a slice of provolone on my sandwich for lunch yesterday! I have yet to meet a cheese I didn't like! What a beautiful platter! One of our markets has a similar basket....this one had odds and ends meats & cheese. You're right...they're great for lunches! I'm not a huge cheese eater, but the one kind I love for it's creaminess is an Italian cheese called "Casatta". It's like mozarella, but much creamier. I don't buy it...too dangerous at my place....but my Mom always has it so I steal some there on occasion! OH I BANNED cheese from my life...and the last time I ate some was last night. I can omit diary of all sorts and kinds but cheese has to stay, in some degree. Um, pretty sure cheese is a staple in my house! My store has what they call "cheese ends" and they sell them for $1.99 a pound - I usually just shred it when I get home and love the combination of flavors. Favorite cheese though? That's a tough one - I'd have to say goat cheese first, then pepper jack second! Oh that looks so good! As I've said on my posts, I am becoming a BIG cheese fan! My favorites are Swiss and Blue cheese, but I also love feta, and cheddar. I want to do some more experimenting with cheese, in the future. I get those little itty bitty cheeses too :) except mine are from my local health food store. Love the sample sizes (cheaper than buying a couple whole blocks too!). I love raw cheddar cheese and fresh mozzarella. Oooh, and melty brie. I had some parmesan cheese yesterday on top of my pasta, mmmm! I really like big shaved slices of a good parmesan too. Mmmm, sounds good right now. Mmmm, that cheese platter looks lovely. I am a big cheese fan and love pretty much all of it. My favorites are probably feta and smoked gouda. I’ve never noticed the Bits and Pieces basket at Whole Foods, though! Will definitely keep my eye out the next time I’m there. The last time I ate cheese was today with lunch when I had some shredded cheddar on my Mexican salad. I love all cheese. Just had some goat cheese in my salad. I love mozzarella, manchego, and swiss. Pasmesan is in that list, too, but who doesn't like parmesan. Though, I'm not privy to a specific type. I'll try almost any cheese. As to how often, I guess that depends on what I'm going to eat during the week. That's so cool! I would love that! I haven't had cheese in a while, I enjoy cheese but just haven't been eating much dairy these days. I just remembered - I last had cheese in vegetarian lasagna last week! I think provalone and swiss are my favs! 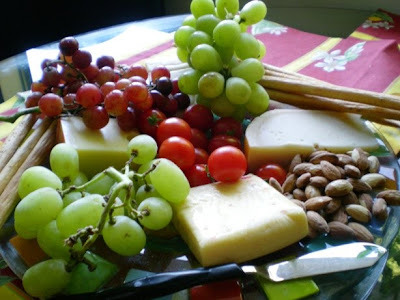 Such a beautiful cheese plate! I love cheese, it is almost too hard to choose a favorite- I love feta, brie, mozzarella -okay, you're making me want cheese right now!! Yum! What a beautiful spread! I'm not a big cheese person but I'd have to say Goat Cheese or Mozzerella! My favorite cheese is brie. I am going to Whole Foods tomorrow possibly... I may have to check this out! I've never seen it before! and by the way, thank you SO much for your input today. I really appreciated it!!! Oh yummy!!! That looks sooo good! I love cheese, I eat it daily without a doubt! I'll eat any kind really, except for blue cheese.. ick! I love cheese. Lots of various types please me, but one of my favs is feta. I had a bit of Australian cheddar last night melted over a risotto cake. HOLY GORGEOUS CHEESE PLATTER! this is right up my alley. 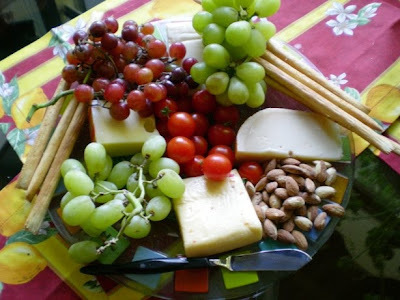 i could eat cheese, fruits, nuts and some crackers and be a happy camper. my fave cheese is GRUYERE...soooooo good! Beautiful platter. I hope my WF have small chunks like that to sell too. I am so jealous! 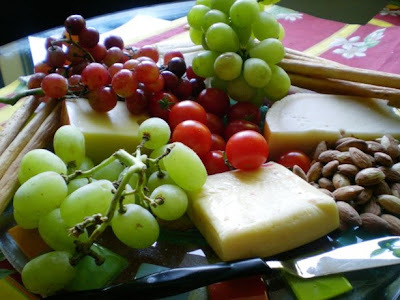 I wish we had a WF here in Iowa :( My favorite cheese so far is Raw Manchego Goat Cheese! YUMMM!!! Gouda is also ranked high on my book!